This is a hybrid (H2/11) developed from the cross between Tree No.1 as female parent and Tree No.273 as male parent and was released in the year 1980. The average yield is 10 kg/tree. The percentage of perfect flowers is about 13 with a fruit set of eight fruits per panicle. Nuts are medium in size with a nut weight of 5g and the shelling percentage of 27.5. Kernel protein percentage is 19.8%. The apple is medium in size and yellow in colour with the juice content of 57%. Kernel grade is W 400. This hybrid is withdrawn from recommendation for cultivation. 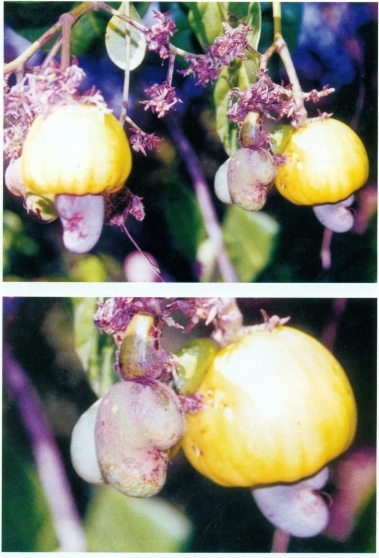 This is a selection from the germplasm collected from Simhachalam in Vishakapatnam district of Andhra Pradesh (3/3 Simhachalam) and the variety was released in 1980. Bisexual flower percentage is 15%. The average yield recorded was 11 kg/tree. The nut weight is 4.8g with shelling percentage of 28.1. Protein content is 19.0%. The apple has juice content of 67%. Kernel grade is W 400. This selection is withdrawn from recommendation for cultivation. This is the selection from germplasm accession of 9/8 Epurupalem and released in 1980. This variety has distinct light pink pigmentation in their youngest leaves. The bisexual flower percentage is about 8%. 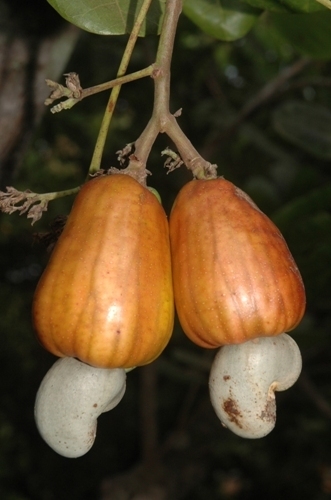 The average yield is 10.5kg/tree with a nut weight of 6g. Shelling percentage is poor (23%). Protein % of kernels is 18.1%. The apple colour is yellow and shape is conical. Kernel grade is W 400. This is the selection from germplasm accession T.No.1. This variety was released in 1980. The bisexual flower percentage is 10%. The nut weight is 5.2g. The mean nut yield is 11kg/tree with shelling percentage of only 24. Protein percentage is also rather low (16.8%). Apple has juice content of 64%. Kernel grade is W 400. This selection is withdrawn from recommendation for cultivation. This is also a selection from germplasm collection. Tree NO.56 was the source material for this variety released in 1980. 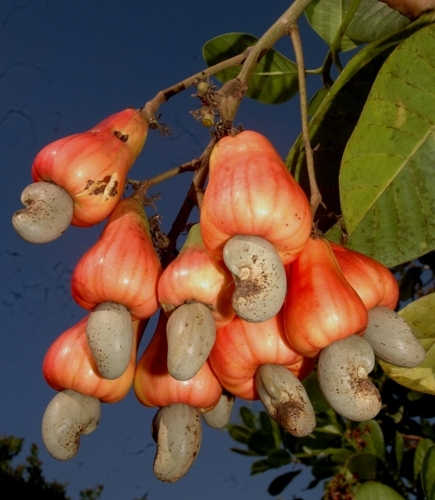 The mean bisexual flower percentage is 8% and mean yield of nuts is about 10.5kg/tree. The nut weight is 5.2g and shelling percentage of this variety is also only 24. Protein percentage is 20.3%. Juice content of apple is very high (74%). Kernel grade is W 400. It is a hybrid (H2/16) derived from the cross Tree No.1 x Tree No.39 and released in 1993 for general cultivation in Andhra Pradesh. It has been performing well in Orissa and West Bengal also. This variety is superior to all the other six varieties developed from Bapatla. 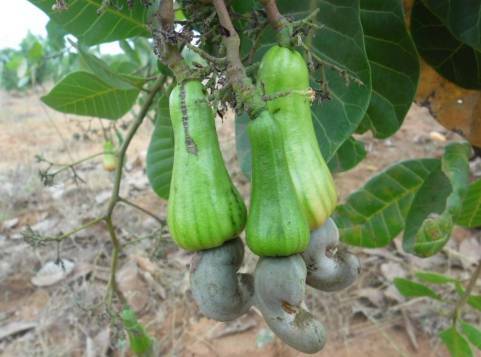 The variety has mean yield of 14 kg/tree with better nut size (8.2g). Shelling percentage (29%) of this variety is also better than the rest of the varieties released from Bapatla so far. Kernel grade is W 210 (export grade). This variety is a selection from germplasm collected from Vazhisodhanipalayam in South Arcot District of Tamil Nadu. 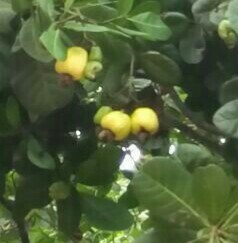 It has a medium sized tree having setting of 5 to 7 fruits per panicle. It was released in the year 1981 and the mean yield is 7.2 kg/tree under Vridhachalam conditions. The nut size is small with 5g nut weight and shelling percentage of 28%. The kernel grade is W 320. This variety is withdrawn from recommendation for cultivation. This is the only variety released at national level based on the multilocational trial conducted at six coordinating centres. This national variety is a selection from the germplasm (T. No. 1668) collected from Kattupalli village of Minjur block of Changelpattu district of Tamil Nadu and released in 1985. This variety is found to be “prepotent” – meaning that the variety is capable of giving good seedling progenies irrespective of male parents. This variety is found adaptable over wide range of soils and regions. The percentage of bisexual flowers is 10 with a setting of 5-8 fruits per panicle. The average yield is about 7.4 kg/tree. The nut size is small with 5.1g nut weight with shelling percentage of 28.3%. The kernel grade is W 320. The colour of the apple is pinkish yellow. 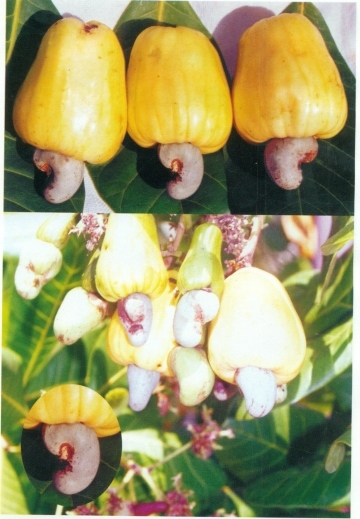 This variety is withdrawn from recommendation for cultivation. This is a selection from seedling progeny of a high yielding tree collected from a village Edayanchavadi in South Arcot District of Tamil Nadu and was released in 1991. It has 12.1% perfect flowers. 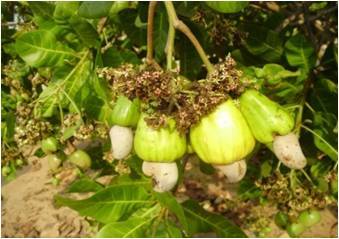 The average yield of this variety is about 10 kg/tree, thus the increase over VRI-2 and VRI-1 being 35 to 39% respectively. The nut size is medium with 7.2g nut weight and shelling percentage of 29.1%. The kernel grade conforms to W 210 export grade. This variety is picking up fast among farmers of not only of Tamil Nadu but also of other states. It is a selection from seedling progeny of WBDC V (Vengurla 36/3), a collection from Regional Fruit Research Station, Vengurla and released in 1989. Flowering season is from January to March with medium duration of 70 days. 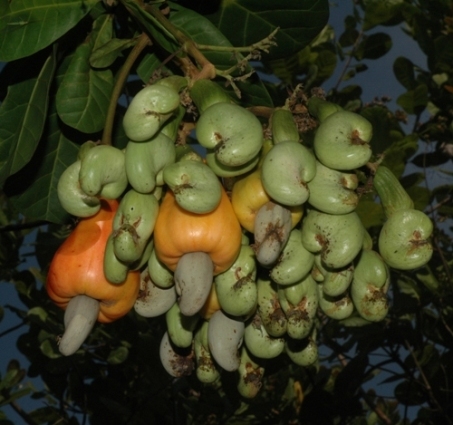 It has cluster bearing habit with about 12 fruits per bunch. 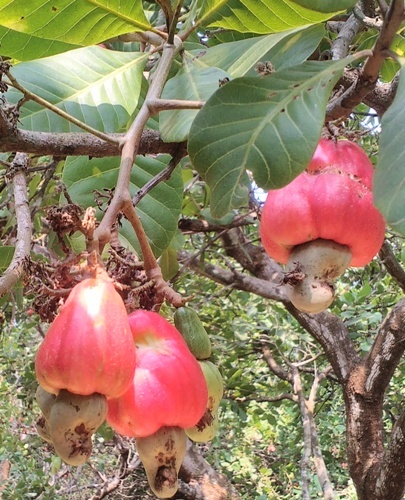 This variety has average yield of 10 kg/tree with small nut size (4.6g nut weight). The shelling percentage is high (32%) with kernel grade of W 320. It has been found suitable for cultivation in the sandy and laterite soils of the East Coast. It is a mid season flowering (Jan-Mar) variety having bold nuts with 8.6 g nut weight. 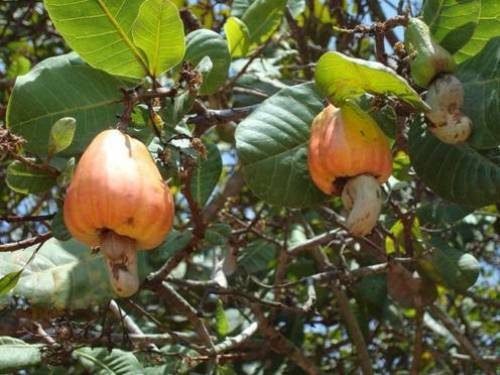 The variety gives an average nut yield of 2.1 t/ha (10.5 kg/tree) and possesses high shelling percentage (32.5 % ). It is an Early flowering (Dec-Feb) variety having bold nuts with 7.4 g nut weight. 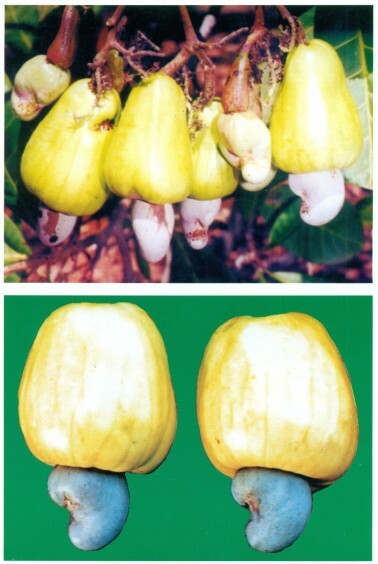 The variety gives an average nut yield of 2.0 t/ha (10.0 kg/tree) and possesses high shelling percentage (30.0 %). It is a selection from T.No.16 originally collected from Bapatla. It was released in the year 1989. It has a medium compact canopy and intensive branching habit. 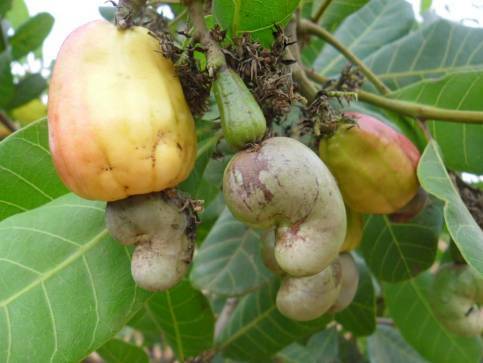 It has on an average, 6 fruits per bunch and yield of 8.5 kg/tree with small nut size (5g nut weight). Shelling percentage is 30 and kernel grade is W 320. It is selection made from seedling plantation of H-2/15 of Regional Research Station, Bidan Chandra Krishi Viswa Vidyalaya, Jhargram, West Bengal. The variety has mid season flowering habit with 3-4 fruits per panicle. Apple is golden yellow with a weight of 63g and a mean juice content of 68.9 per cent. The average nut weight is 9.2g with a kernel weight of 2.85g and high shelling (32%). The kernel grade is W 180.The variety can yield 13.5 kg/tree in 7th harvest. This is a selection from the germplasm (Ansur-1) collected from Ansur village in Vengurla Tehsil of Maharashtra. This was released in the year 1974. The average percentage of perfect flowers is about 8%. The average yield is 19 kg/tree. The nut weight is 6.2g with the shelling percentage of 31. It is early flowering variety. Colour of the apple is yellow. Kernel grade is W 240. This variety was released in the year 1979. 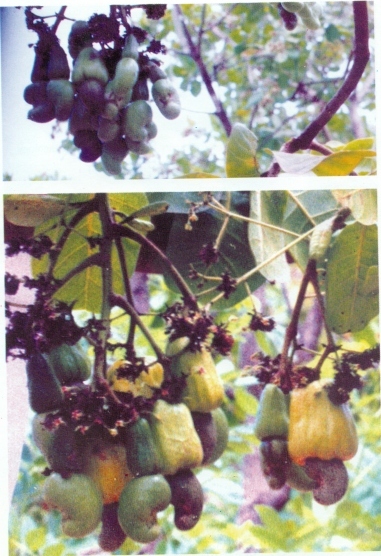 It is a selection from germplasm collected from West Bengal (WBDC VI : Vengurla 37/3). This selection has average perfect flower percentage of 8% and also has short flowering and fruiting phase. The average yield is about 24 kg/tree (in 20th year of age). But the nuts are small with 4.3g nut weight and shelling percentage of 32. Colour of apple is pinkish red. Kernel grade is W 320. 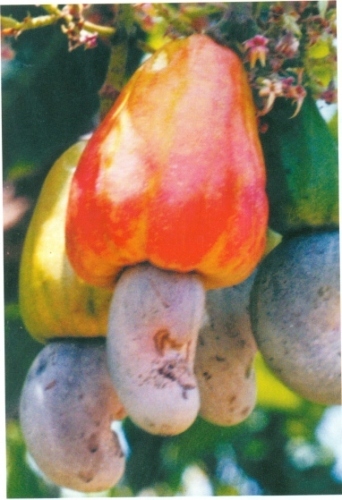 This variety is withdrawn from recommendation for cultivation. This is a hybrid developed from the cross Ansur-1 x Vetore 56 and was released in 1981. The percentage of perfect flowers is 25% with an average fruit set of 7%. Average yield is 14.4 kg/tree. This is a bold nut variety with the nut weight of 9.1g and shelling percentage of 27. Kernel grade is W210 (export grade). This hybrid is withdrawn from recommendation for cultivation. This is a hybrid variety with the parentage of Midnapore Red x Vetore 56 and was also released in 1981. It is a cluster bearing type and with percentage of perfect flowers of 35 and fruit set of 6%. The yield of nuts is 17.2 kg/tree. The nut weight is 7.7g and shelling percentage is 31. The colour of the apple is red. Kernel grade is 210 (export grade). This variety is a hybrid having the parentage of Ansur Early x Mysore Kotekar 1/61. This variety was released in 1984. Very high perfect flower percentage of 50.5% was recorded in this variety. But the fruit set is only around 3.3%. The average yield is 16.6 kg/tree. The nut size is small with 4.5 g nut weight. The shelling percentage is 30. 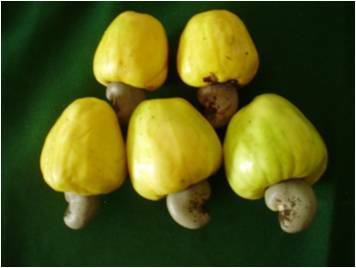 This variety produces small golden yellow coloured apples. Kernel grade is W 400. 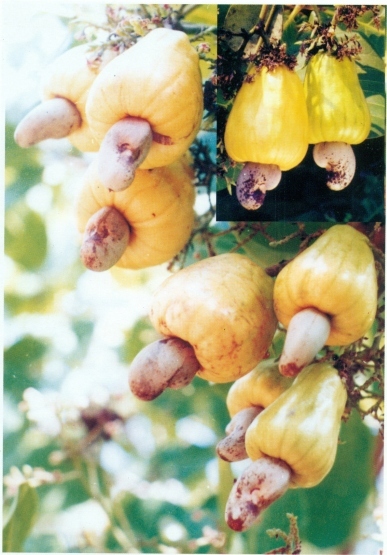 This variety is withdrawn from recommendation for cultivation. It is a hybrid of cross combination Vetore 56 x Ansur – 1 and released in the year 1991. 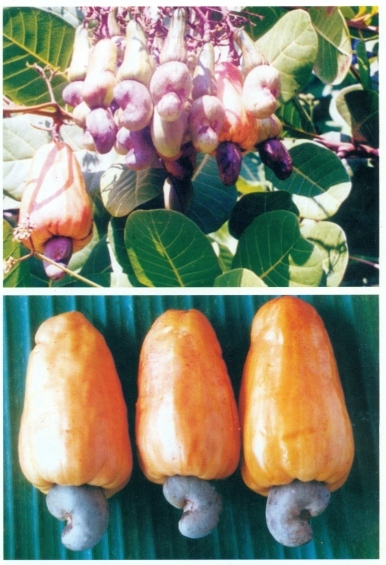 The variety has average yield of 13.8 kg/tree with nut weight of 8g. The kernel grade is W 210. This variety is popular among farmers. 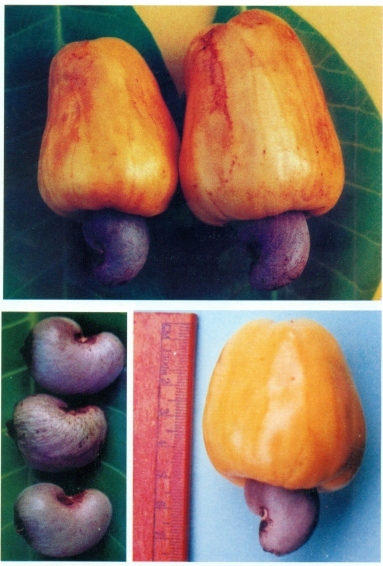 Hybrid 255 evolved at Regional Fruit Research Station, Vengurla under Konkan Krishi Vidyapeeth, Dapoli was recommended for release under the name “Vengurla-7” in the XIII Biennial Workshop of AICRP on Cashew held in November 1997. Vengurla-7 is a hybrid developed from the cross Vengurla-3 x M 10/4 (VRI-1). The percentage of perfect flowers is very high (40%). Average yield is 18.5 kg/tree. It is a bold nut type with nut weight of 10g and shelling percentage of 30.5. Kernel grade is W 180. The colour of apple is yellow with apple weight of 60g and with juice content of 75 per cent. Average weight of kernel is 2.9g. 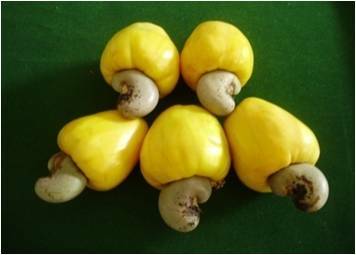 This variety is recommended for the Konkan region of Maharashtra and adjoining cashew growing regions of Goa and Karnataka. It is a hybrid released in 2001 and yields 15-20 kg /tree. It has bold nuts with 86 nuts / kg. it is red apple variety with juice recovery is 85%. 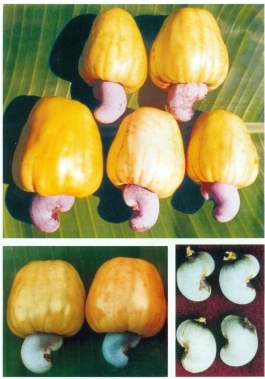 Goa-1 was developed and released from ICAR Research Complex, Goa in 1999. 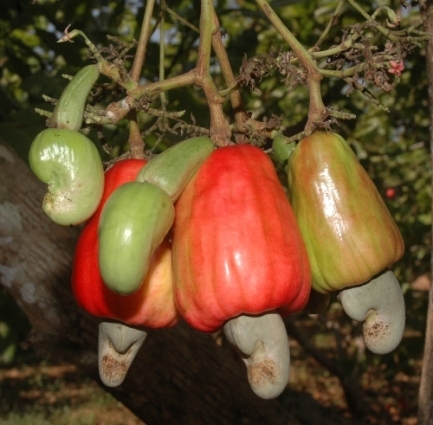 It is the first cashew variety released from the state of Goa. 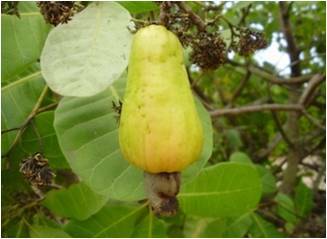 It is a selection from accession Balli-2 which is originated from a tree located in Balli village of Quepem taluk of Goa. 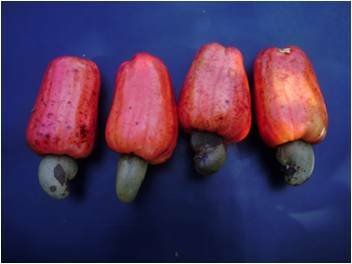 The average yield of Goa-1 is 7.0 kg/tree with nut weight of 7.6 g (range : 7.3 – 7.9 g) and the shelling percentage of 30.0 (range : 28.9 – 31.0%). Kernel weight is 2.2 g. The kernel grade is W 210. Apple colour is yellow and with average weight of 66.7 g and with average juice content of 68.0%. It is recommended to the state of Goa. 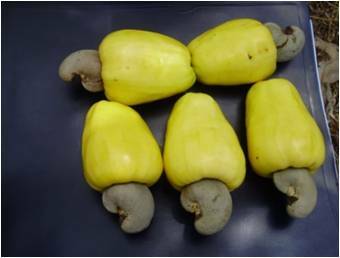 Goa-2 was developed and released from ICAR Research Complex, Goa in 2007. It is a selection from Ela village of Tiswadi taluk of North Goa District. 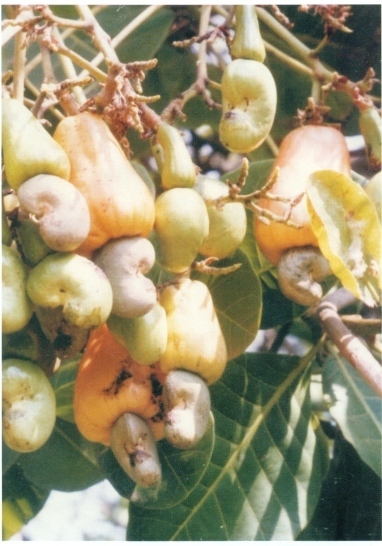 The average yield of Goa-2 is 5.5 kg/tree with nut weight of 9.4 g (range : 9.2 – 9.6 g) and the shelling percentage of 29.25. Kernel weight is 2.3 g. The kernel grade is W 210. Apple colour is yellowish orange with cylindrical shape and with average weight of 105 g. Juice content ranges from 68.0 – 72.0 per cent. It is recommended to the state of Goa. It is a selection from seedling progeny of Tree No. 39 of Bapatla. The variety was released in 1987. The flowering season is from November to January. The mean yield is 13.8 kg/tree. The nuts are medium sized with 6.2g nut weight. Shelling percentage is 26.8. The kernel weight is 1.6g and kernel quality conforms to W 280. Apple colour is yellow with a weight of 52g. Reducing sugar content is 10.5%. This is a selection from germplasm collection made from Neduvellur in Kerala maintained at CRS, Anakkayam. This variety was also released in 1987. The mean yield is 17 kg/tree. The nuts are bold (7.3 g nut weight) with shelling percentage of 26.2%. Kernel weight is 2g having a count of W 240 export grade. Apple colour is red and with weight of apple 63.3g. Reducing sugar content is 7.8%. It is a hybrid of cross BLA 139-1 X H 3 – 13 released in 1993 from CRS, Madakkathara. It is an early variety. 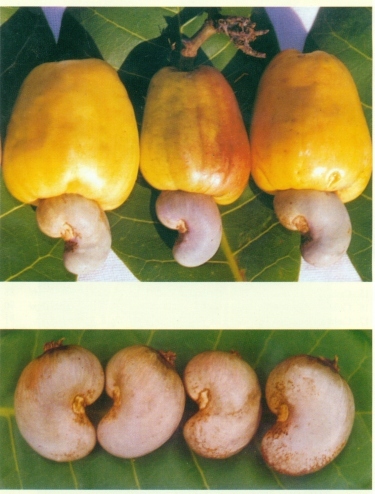 Average yield is 19 kg/tree with a mean nut weight of 6.8g. Shelling percentage is 31%. Kernel weight is 2.1g and quality of kernels conform to W 210 export grade. Colour of apple is yellow. It is a hybrid of cross ALGD-1 X K 30-1 released from CRS, Madakkathara in 1993. It has cluster bearing habit. The mean yield is 17.5 kg/tree with a shelling percentage of 28. Kernel weight is 2.2g conforming to export grade of W 210. Yellow is the apple colour. 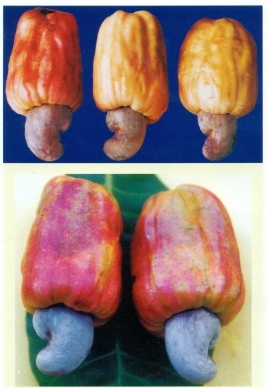 This is a hybrid with parentage of BLA 139-1 X K 30-1 with jumbo nut size developed and released from CRS, Madakkathara in 1995. The yield of nuts is 16.9 kg/tree. The nut weight is 10.8g with kernel weight of 2.87g. Shelling percentage is 26.5. The export grade of kernels conforms to W 180. Colour of apple is yellowish red. Apple weight is 135g. Apple has 57.4% of juice. This is a hybrid with parentage of BLA 139-1 x H 3-13 developed and released from CRS, Madakkathara in 1999. It has yield potential of 18.4 Kg/tree with nut weight of 7.2 g. Shelling percentage is 31.6 and with kernel weight of 2.2 g and kernel grade W 210. Colour of apple is yellow and apple weight is 76.0 g. Apple has 57.4% juice content. 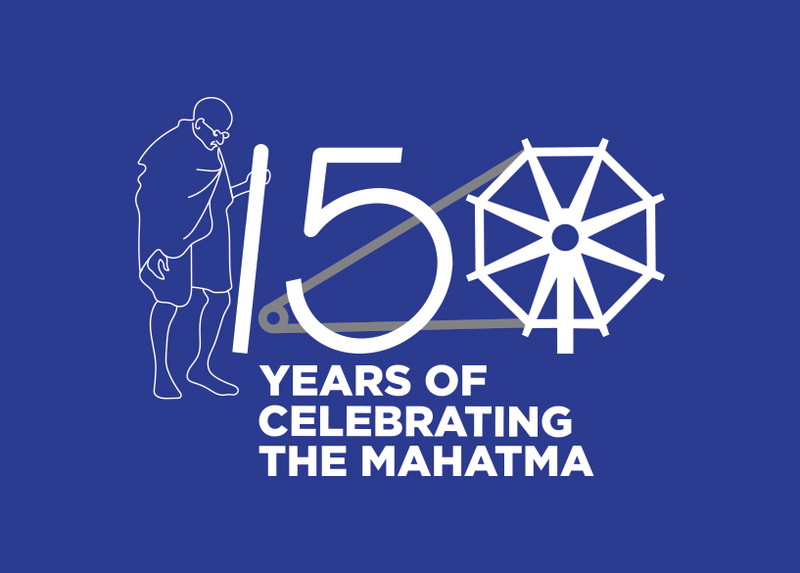 It is recommended to the state of Kerala. It is selection released in 1996 with compact canopy and intensive branching. It is bold nut type with 9.8 g nut weight. 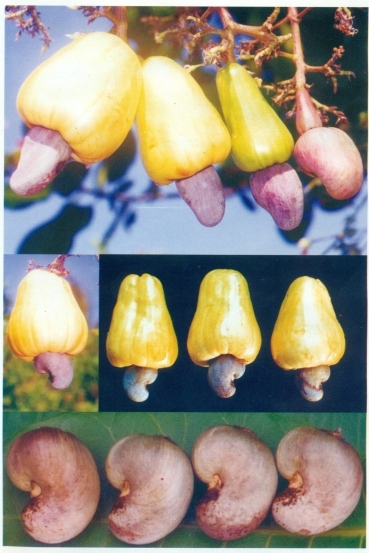 The tree yields 21.9 kg of nuts with high shelling percentage (29.4%). The kernel weight is 2.88 g and grade is W 210. It bears light orange apples. This is a selection from the seedling progeny of Tree No 139 of germplasm collection of Agricultural College, Bapatla, Andhra Pradesh. The variety was released in the year 1985. The variety has a short flowering duration. The yield is 12 kg/tree. The nut weight is 6g and shelling percentage is 28. Colour of apple is pink. Average apple weight is 67.5g. Reducing sugar content is 10%. Kernel grade is W 280. It is hybrid released during 1996 with a parentage of T 30 X Brazil-18. 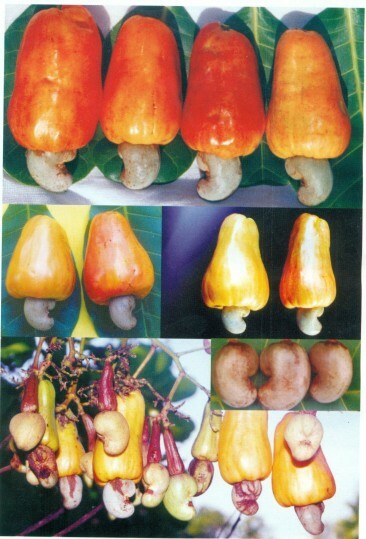 It has yield potential of 15.0 kg / tree with nut weight of 7.8 g. Shelling percentage is 30.5. The kernel weight is 2.4 g and grade is W 240. It bears yellowish pink apples. It is hybrid released during 1998 with a parentage of H-4-7 X K -30-1. It has yield potential of 11.0 kg / tree with nut weight of 11.0 g. Shelling percentage is 28.4. The kernel weight is 3.12 g and grade is W 180. It bears yellow apples. It is hybrid released during 1998 with a parentage of T 20 X K -30-1. 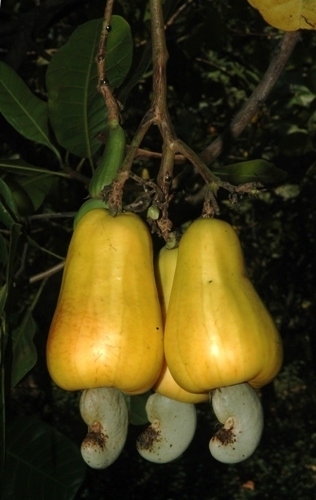 It has yield potential of 13.7 kg / tree with nut weight of 10.0 g. Shelling percentage is 29.0. The kernel weight is 2.9 g and grade is W 180. It bears orange red apples. 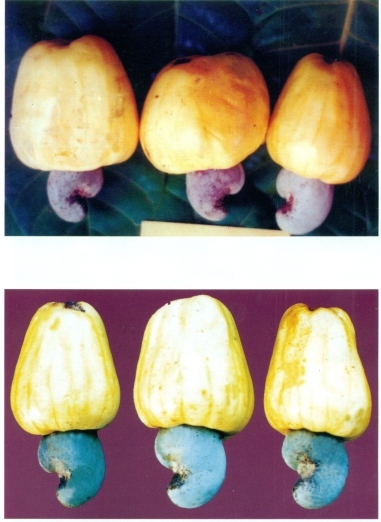 This is a selection from the germplasm collected from Taliparamba in Kerala (8/46 Taliparamba) and released by ARS, UAS in 1984. The variety has 2-3% of bisexual flowers. The average yield is 16 kg/tree. The duration of harvest is long (about 110 days). The nut weight is 6.7g with shelling percentage of 30.7%. The colour of apple is yellow. Kernel grade is W210. This is a selection from germplasm collected from Guntur in Andhra Pradesh (3/67 Guntur). This variety was also released in 1984. The variety is a late flowering type (December to March) with very short duration of harvest (85 days). The yield is about 9 kg/tree. The nut size is medium with 6g nut weight and shelling percentage is 30.5. Colour of apple is light red. Kernel grade is W 240. 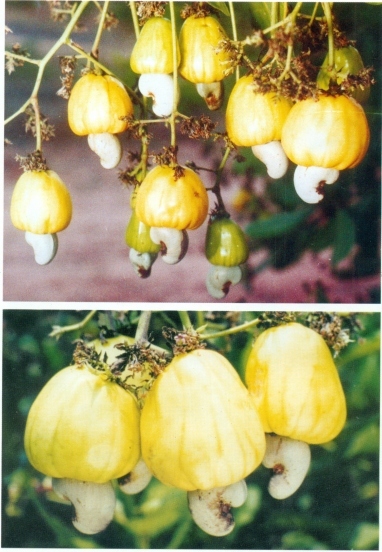 This variety is withdrawn from recommendation for cultivation. It is a selection from 5/37 Manjeri and released in 1993. It is early in flowering (November – January) and fruiting period is very short (50-60 days). 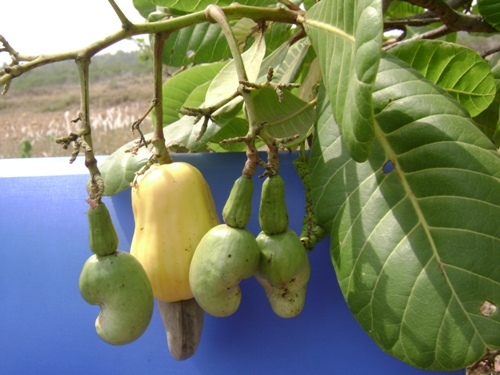 The fruiting is from January to March and sometimes starts from last week of December. 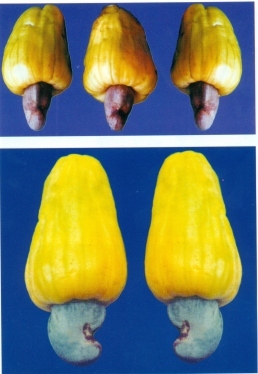 It is a high yielding variety with average yield of 14.7 kg/tree. 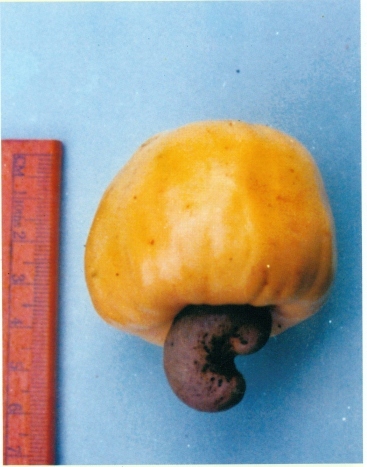 The nut size is medium with nut weight of 7g. The shelling percentage is 30% and the kernel grade conforming to W 210 grade. The colour of apple is red. It is a selection from 2/77 Tuni Andhra and released in 1994 for general cultivation. The average yield is 9.5 kg/tree. The nut size is medium with 7.2g nut weight. Shelling percentage is 31%. Export grade of kernels conforms to W 210 counts/lb. The colour of apple is yellow and apple weight is 75g. This is a selection from Nileshwar 2/27 (T.No.25) and released in 1995. This is a medium duration variety. The average nut yield is 10.5 kg/tree. The nut weight is 9g and shelling percentage is 32.8%. The kernels are suitable for export with more than 85% of kernels coming under W 180 export grade. Apple colour is yellow. This variety was released in the year 1989. This is a selection from segregating progeny of germplasm 3/8 Simhachalam (VTH 107/3) originally a collection from AP. It is a late flowering type (December – February) with a flowering duration of 82 days. The number of fruits per bunch is 5. The yield, on an average, is 10 kg/tree. The nut weight is 7.6g. The shelling percentage is 28.8% and the kernel grade conforms to export grade of W 210. Apple colour is yellow. This variety is withdrawn from recommendation for cultivation. This is a selection from the segregating seedling progeny of 2/9 Dicherla (VTH 40/1) originally a collection made from Andhra Pradesh. This variety was released in 1989. It has a mid season flowering habit (November – January) with a flowering duration of 74 days. 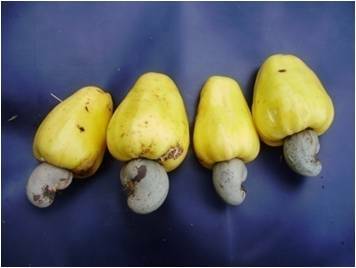 The number of fruits per bunch is 3. The average yield is 9 kg/tree. The nut weight is 9.2g. The shelling percentage is 28.6% and kernel grade conforms to export grade W 210. Colour of apple is pink. 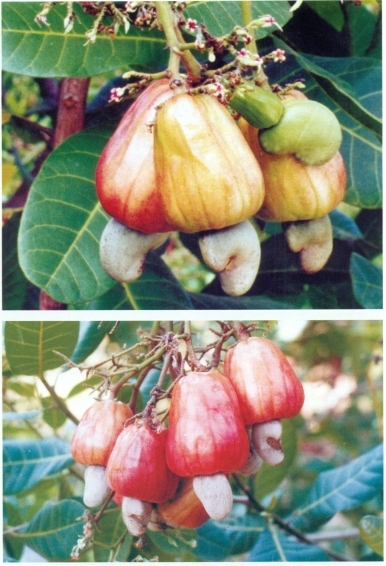 This variety was released during March 2006 for coastal region of Karnataka. This is having midseason flowering habit (Dec-Mar) with a flowering duration of 60 days and has potential to escape from the attack of the tea mosquito bug (TMB) under low to moderate outbreak situation. But the regular insecticidal spray against TMB is essential under severe out break situation. The number of fruits per panicle (bunch) ranged from 4 -13. The average yield on 13th year was 10.7 kg/tree with highest yield of 19 kg/tree. The nut and kernel weight are 7.4 g and 2.2 g respectively. The shelling percentage is 30.6 and kernel grade conforms to export grade W240. The apple colour is pinkish orange and juice content is 67.5%. 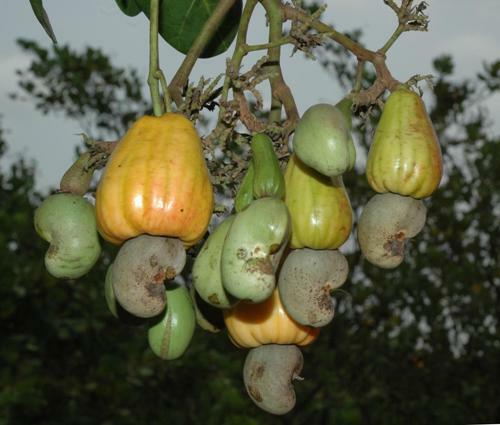 This variety is very popular among the farmers of Dakshina Kannada District of Karnataka and also in neighbouring districts of Karnataka and Kerala. It is a selection from 8/46 Taliparamba, a germplasm collection from Taliparamba in Kerala and released in 1993 from ARS, Chintamani. This variety is recommended for plain region of Karnataka. 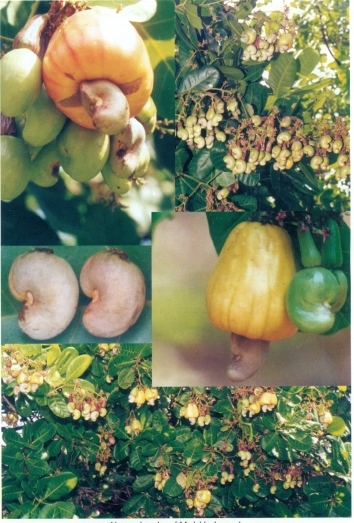 Its flowering period is from January to April with 2-4 nuts per panicle. 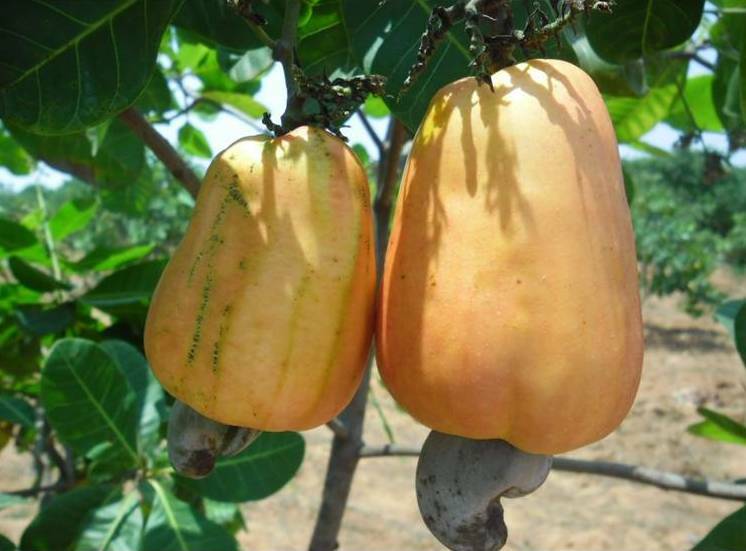 The average yield of this variety is 7.2 kg/tree as against the 2 kg/tree of the local varieties. The nut weight is 6.9g with shelling percentage of 31%. The kernel grade is W 210. It is a seedling selection from ME 4/4 of ARS, Ullal and released in 2007 from ARS, Chintamani. This variety is also recommended for plain region of Karnataka. The canopy type is compact and with intensive branching. Its flowering period is from December to January. The average yield of this variety is 12.4 kg/tree. The nut weight is 7.9g with shelling percentage of 30%. The kernel weight is 2.35 g. The kernel grade conforms to W 210. The colour of the apple is red purple with average weight of apple of 70g. Juice content is 60%.